The service industry which amounts to more than 80% of the world economy is a significant driver for worldwide economic growth. Best practices and guidance related to developing and improving service practices is a critical success factor to improve the efficiency, performance, customer satisfaction, and profitability of the service sector. CMMI® for Services (CMMI®-SVC) model has been designed to meet these needs. 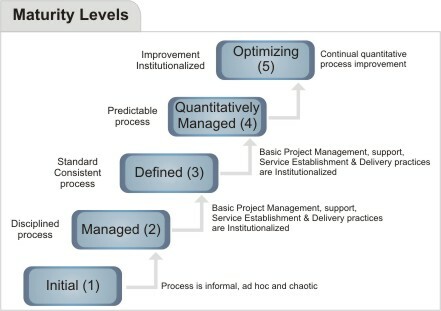 CMMI®-SVC places proven practices into a structure that helps an organization to assess its organizational maturity and process area capability, establish priorities for improvement, and guide the software process improvement initiative. Up to ML3, it helps in putting the basics of service delivery and service management and builds a strong foundation for implementing the CMMI High Maturity Practices. Note: Going by the CMMI® model definition: Services are useful intangible and non-storable results delivered through a service system. CMMI®-SVC is an industry neutral model that can apply to any service industry be it BPO, Telecom, IT, Hospitality, Health Care or any other. CMMI® for Services is an evolution from the earlier CMMI® Models that have addressed Development as well as Acquisition of Products and Services. This Constellation is focused on delivery of Services. With 16 of the 24 Process Areas coming from the Common Model Foundation (for all the Constellations) the CMMI® constellations give a common approach to implement many Project Management, Organizational Process Management and Supporting areas of work in an organization. The model is also supported by the SCAMPI appraisal methodologies. CMMI®-SVC also has synergies with other models & standards like ITIL, ISO 20000, CobiT and ITSCM.